Discover Indemne’s latest newcomer with its ultra-gourmet fragrance and flowerchild-chic look... olfactotherapy for pure well-being and comfort for your body, spirit and mind! We’ve entered a whole new age, one where an innovative concept can boast that its prime concern is to promote peace of spirit and mind through a delicate fragrance released by its coconut vanilla. It was formulated using a selection of a dozen essential oils including sweet orange, ylang-ylang as well as Roman chamomile which help beat anxiety and enhance self-confidence: in essence, the first-ever anti-stress cosmetic product. You’ll be definitely touched by its fragrance... Like Proust's madeleine, it conjures up unforgettable childhood memories. 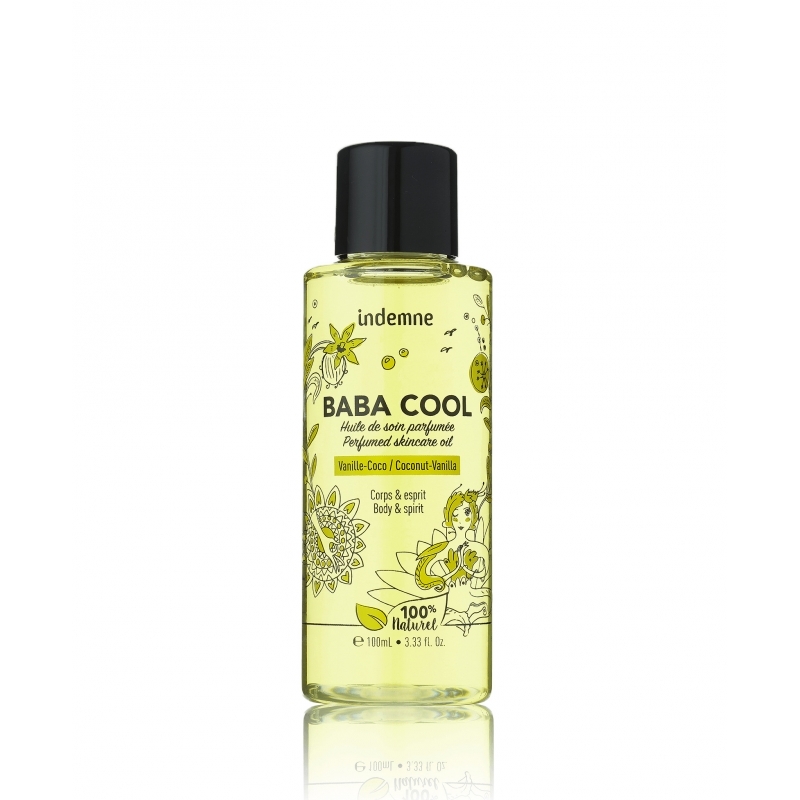 BABA COOL also overflows with benefits for the body - nourishing, softening, beautifying, perfuming and strengthening the skin through its avocado, grape seed, macadamia and sweet almond oils, rich in vitamin E, omega 3 and 6 and antioxidants. The adventure’s about to begin... enjoy discovering our brand new concept. In an enchanting flowerchild-chic world, our avant-garde, state-of-the-art care oil offers well-being and comfort for the whole family’s body, spirit and mind! This 100% natural, ultra-gourmet coconut-vanilla scented zenitude oil takes you on a journey to the tropics... via a bottle! The perfumed care oil by Indemne not to be missed to be ultra cool! * Valid on all our site (excluding travel and accessories only).